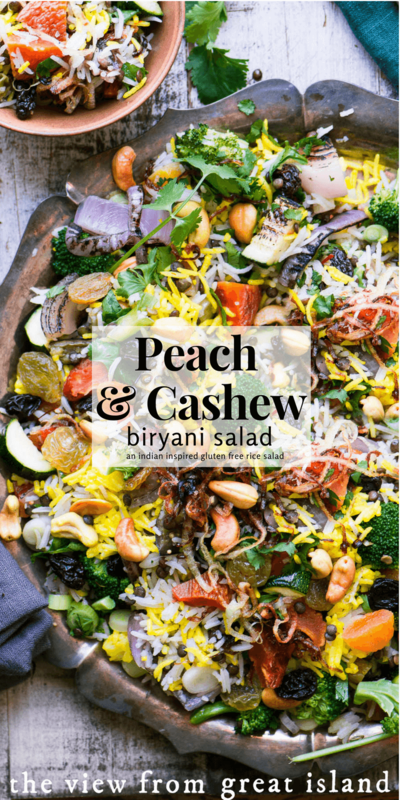 Peach and Cashew Biryani Salad ~ barbecues can be pretty staid affairs what with the same old burgers, potato salads, and slaws, so here’s a thought ~ next time you’re asked to bring something, ditch Aunt Rose’s macaroni salad and make this knock-out rice pilaf salad instead. I don’t read many food magazines these days because I just don’t have the extra time, but I always buy one or two to help me pass the time when I fly. I usually end up annoying anybody sitting near me because I’m madly ripping out pages for the duration of the flight. 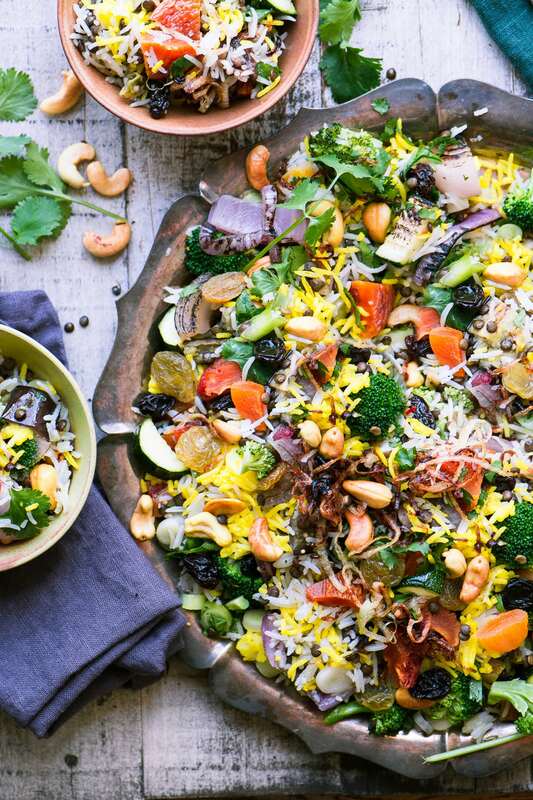 One of the torn pages from my last flight inspired this stunning biryani salad ~ it’s adapted from a recipe in this month’s Food & Wine. It’s so up my alley I just had to make it and share with you. I adore biryani, it’s my standing order at any of the (many!) Indian restaurants we get take out from. It’s a beautiful, vibrant dish that’s also incredibly satisfying, even when it’s vegetarian, like this one. 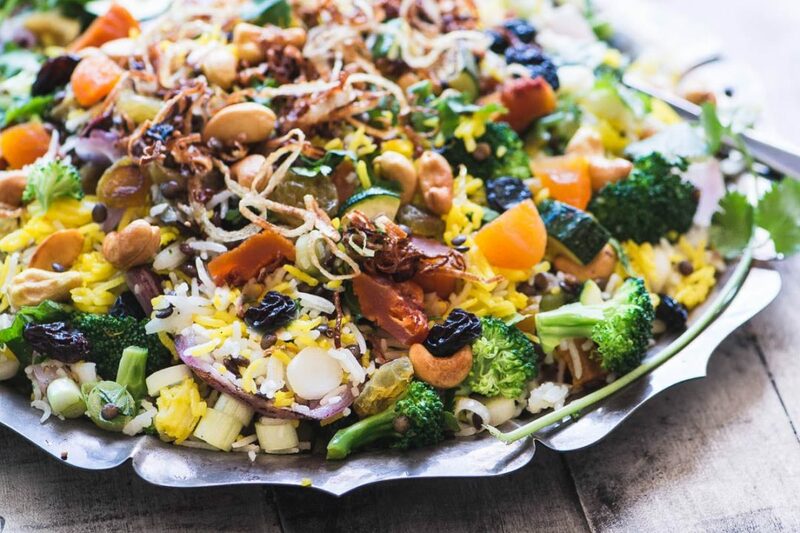 The vegetable biryani I usually get from our local restaurants aren’t nearly as colorful or chocked full as this one, but the basics are there…fluffy basmatic rice, aromatic saffron, cashews, spices, garden veggies. This version has quite a few bonus ingredients like plenty of dried fruit, and a flourish of very finely sliced fried onions. Instead of being a hot main course, this one is more of a room temperature ‘salad’. It’s a fabulous recipe if you’ve got leftover rice, because you can focus your attention on all the pretty extras. 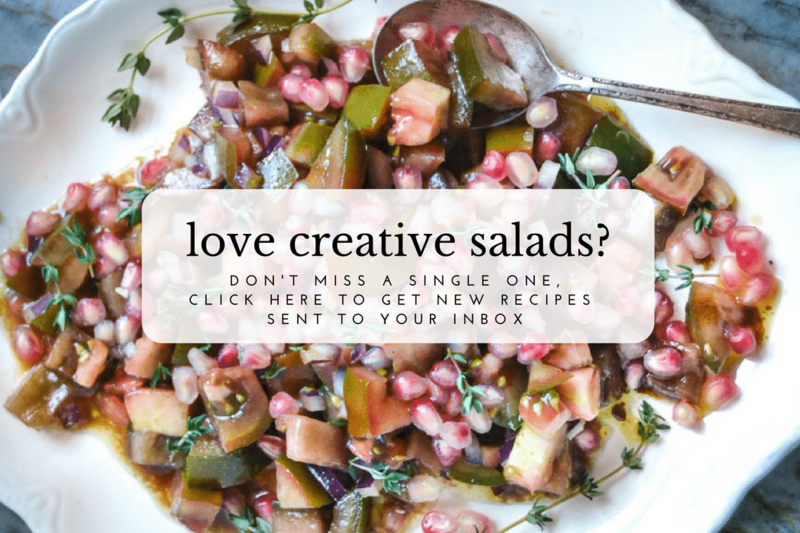 If you bring this stunning salad to a potluck or church supper you’re bound to get oohs and aahhhs, and so the few extra steps in this recipe won’t be in vain. It’s a wonderful dish for a gathering because you don’t have to worry about keeping it piping hot or cold. 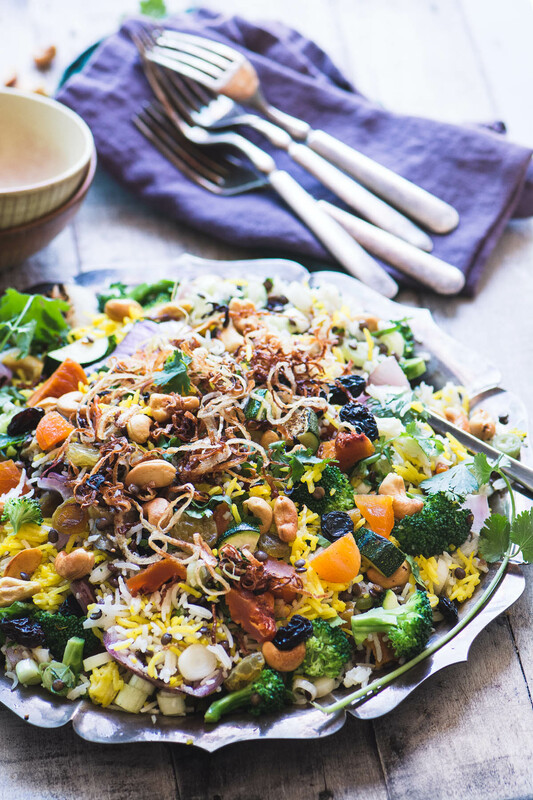 Peach and Cashew Biryani Salad ~ a healthy vibrant salad inspired by a classic Indian rice dish. Make it with chicken ~ add some shredded or cubed cooked chicken for a main course salad. I love to bring new and exciting dishes to the table, especially when I can introduce new flavors and combinations to friends and family. 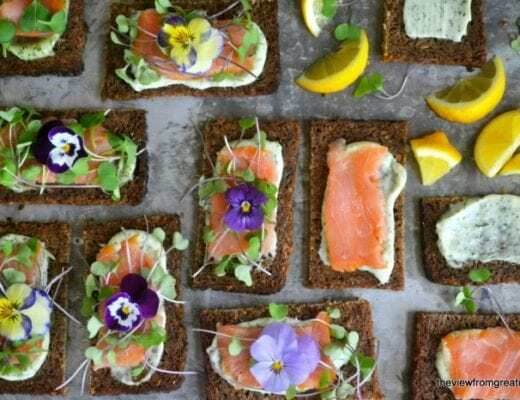 If you’re called upon to bring something to a gathering, why not try something a little off the beaten path? My Spicy Thai Spaghetti Salad is a great example of a dish that takes a beloved classic and tweaks it, and my Fried Cabbage and Bacon Slaw is always the first to go at any party. This Chopped Turkish Salad also sounds delicious, and no one will expect this Corn and Blueberry Salad! I made it step by step, reading your instructions. It was super delicious. Thank you for sharing this. This made me happy. I made this the other night, with only a few minor substitutions, and with the addition of microplaned lemon peel in the dressing. It was outstanding! Definitely a keeper– beautiful, and with so many different flavors it was like a party in your mouth! I am a bit confused about the red onion. It states to cut in half and place with all veggies in oven. Do you only use one half in that way and the other half cut thin to saute? Such a creative and pretty salad! Loving all the colours and flavours. Beautiful! What a terrific way to use peaches! And I don’t think I’ve ever had peaches and cashews together in the same dish — love the idea. This looks like it’s loaded with flavor, and we’re practically living on salads these days, so this a timely recipe for us. Thanks! I agree John, just those two ingredients together sounds so enticing. Haha! I’m totally with you on the magazine thing. I save all of mine up for when I travel and yes, tear out the pages! I always have a pile of torn pages stashed in my cupboard – my little inspiration corner. 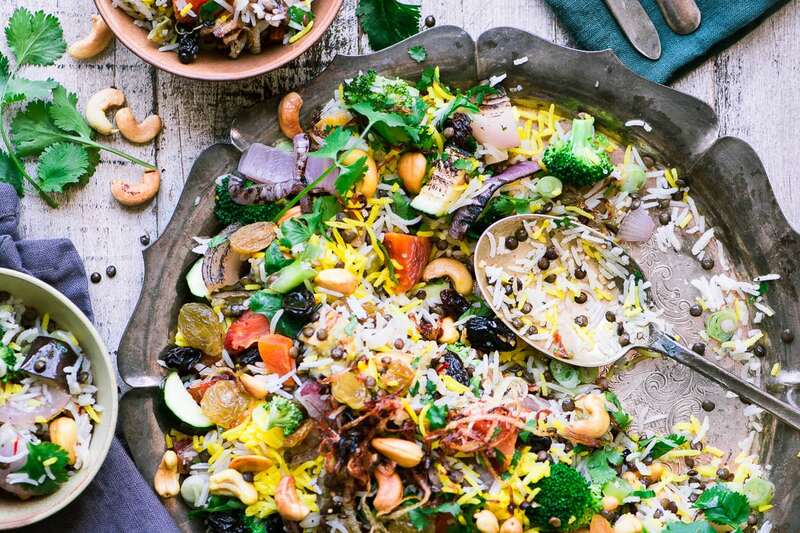 This Biryani Salad looks amazing and loaded with everthing I love. Can’t wait to try it!! WOW! This is the most vibrant biryani I’ve ever seen. I’ve never made it at home and never thought of its vegetarian version. Love your twist! 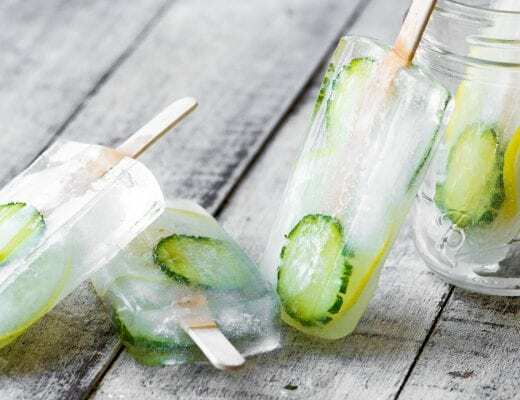 Have to try it this summer! Husbands! 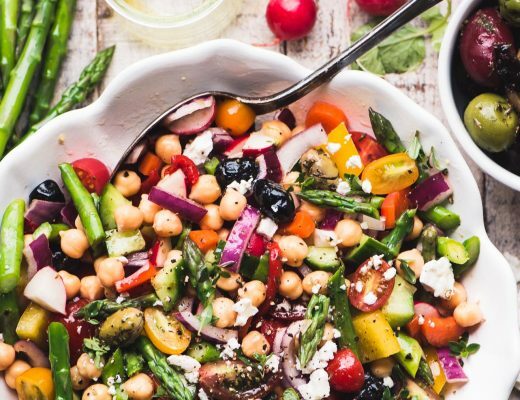 Maybe you could serve the veggies raw in this salad, that would work. All that goodness in one gorgeous salad! I really wish I could have this for breakfast this morning! You know I have the classic Indian/British Kedgeree on the blog, Tricia, and that’s a breakfast dish made with rice and curry!